The following three singers, each of whom is Vietnamese traditional music performer, one after another, brightened up and beautified the already popular theatrical arts of Cai Luong (Southern traditional folk plays). Three different characters, three singing voices, three completely different performing styles, yet they have two things in common – each became famous at a young age, and each possessed a unique talent that led them to their most glorious standings within the entertainment industry. Up until now none of them have been awarded any titles in singing Vong Co (the singing component of Cai Luong), but no one can deny that their voices helped make Vong Co more popular than ever. “My unique ability is to sing really low, with a deep tone,” My Chau said. She has had singing talent even at a young age, but it was in modern ballads instead of traditional music, which is what Vong Co is all about. Even to this day, she still prefers pop music. My Chau recalls when she was a young girl in the countryside, every time she turned on the radio she always heard Thanh Huong, a well-known singer at the time, sing. The first two songs that My Chau learned at the beginning of her career were Cô Bán Đèn Hoa Giấy (The Girl Who Sells the Paper Lanterns) and Tâm Sự Cô Gái Mù (The Innermost Feeling of a Blind Girl), which, coincidentally, were the same songs that Thanh Huong sang on the radio long ago. 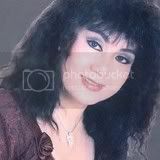 But when My Chau became a singer herself, she most admired actress Ut Bach Lan, who was also a famous singer. As a young girl, My Chau would listen and obey her mom’s orders without having the faintest idea of what Cai Luong was all about or the difficult road ahead. “I was fortunate enough to be born with traits from which I can distinguish right from wrong. At the beginning of my career, I was able to figure out the right path. I remember the very first time I went to a recording studio to have my voice tested, they told me to go home and imitate the voice of a famous actress at the time. I just smiled with disgust and promptly left the studio. Luckily, when I joined the Asia recording company, no one had asked me to do the same thing; otherwise, there would not have been a My Chau as you know today.” She smiled happily when recalling the incident and one could sense the pride in her voice. How could she not be so proud when she was considered one of the finest actresses of all times? And apparently, keeping her own unique style many years ago at the recording studio, and not imitating someone else’s voice, turned out to be her greatest asset later on. My Chau’s voice was so unusual for a female singer in such a way that she could sing low and deep tunes with ease, which is very rare among female singers, usually only male singers have this capability. She also enhanced her voice through creativity and proper techniques to make it even more mellow and soothing to the audiences. She said, “I realize my voice is very low and deep, which is quite unusual, so I use it to my great advantage. I have discovered some wonderful sounds and range of emotions at these really low, low notes. Since then, whenever I sing the first verse of a Vong Co song (a complete song contains six verses), I use two “huyen” (falling tone), or one “huyen” and one “nang” (falling-glottalized tone) accents. These low-toned accents really accentuate my unusual voice. However, I could not have accomplished so much if it were not for the talented team of song-writers such as Vien Chau, Loan Thao, and Trong Nguyen who took each singer’s unique voice into consideration and tailored the songs just for that particular singer. As a result, both the songs and singers could showcase their best and leave a lasting impression on their listeners." My Chau’s voice was once called an “ethereal voice” because of its full range of emotions such as sorrow, sadness, etc. It is so unique that so far, no other singers have ever been able to duplicate it. She is very skillful at singing Vong Co, but the audiences remember her the most through her acting in Cai Luong plays such as Tieu Anh Phung, Trinh Nu Lau Xanh, etc. Thanh Kim Hue was the leading actress for the Kim Chung company in 1974, and the two plays that she and the audiences liked the most were “Duong Guom Nguyen Ba” and “Lan va Diep.” In terms of Vong Co songs, she has recorded numerous ones, many of which have been imprinted in the listeners’ memory. Thanh Kim Hue possesses a very clear, high-pitched voice, and when combined with her artful singing techniques, her extraordinary voice really stands out, very similar to an already beautiful girl who knows how to use accessories to multiply her beauty. Her voice has brought so much freshness and a youthful look to the stages and plays, and helped make the audiences happy and relaxed. 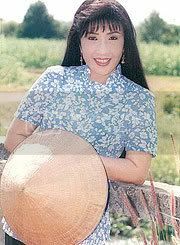 She became famous in 1972 after recording the song “Yeu lam” (Mistaken love), written by Loan Thao, with the recording company Vietnam. Since the first song, “Sao khong thay anh ve” (Why don’t you come home? ), she has incorporated the Hue’s accent into the songs to make them even more interesting. Hue is located in Central Vietnam, and no one had tried to sing Vong Co using Hue’s accent before as the Southern accent is usually used. Nevertheless, the listeners loved it! Thanh Kim Hue’s voice remains the same to this day, still as clear as crystal, high-pitched, and exuberant. It is bringing joy and happiness to every family. “For nearly 40 years, Le Thuy has been the leading actress. She still possesses the charms that make the audiences remember fondly about her,” said Diep Lang, a well-known actor, when speaking about Le Thuy. To her many fans, Le Thuy is their favorite actress because of her simple yet wonderful singing voice and her down-to-earth demeanor. A mixture of alto and soprano, her voice once stirred the interest of the Cai Luong community with popular Vong Co songs such as Em Bé Đánh Giầy (The Shoe-Shine Boy), Cô Hàng Chè Tươi (The Girl Who Serves Tea), Nấu Bánh Đêm Xuân (Cooking Rice Cake for the New Year), Lương Sơn Bá-Chúc Anh Đài, etc. At that time, some people thought Le Thuy was influenced by Thanh Huong, an older-generation performer and a famous singer who sang the infamous song Cô Bán Đèn Hoa Giấy (The Girl Who Sells the Paper Lanterns), but Le Thuy injected freshness and enthusiasm into this same song, which helped link the two generations of listeners closer to their beloved arts of Cai Luong. After nearly 40 years of singing Cai Luong, Le Thuy’s voice has never faded with time. She has not strayed away from her down-to-earth style, either; and one can still feel the warmth and sincerity in her voice. At 14 years of age, too young to understand the soulful and profound meanings of those Vong Co songs, yet Le Thuy was a much-sought-after singer by many recording companies that hoped to bring new voices to their listeners. One of those who brought fame to Le Thuy was writer/composer Vien Chau, who let the then-unknown Le Thuy sing Em Bé Đánh Giầy (The Shoe-Shine Boy) with Minh Canh, a very famous actor at the time. Thanks to this opportunity, Le Thuy became the top actress, and at a tender age of 16, she received the prestigious Thanh Tam award, similar to the Academy Award in America. Le Thuy was born in Vinh Long, a small town in southern Vietnam. After her house was burned down, her parents decided to leave Vinh Long and moved the whole family to Saigon, a big city. Because her birth certificate was lost in the fire, she had to attend private schools. (Note: Public schools in Vietnam are hard to get in and, in general, are much better than private ones.) Her family was very poor, and being the oldest daughter, she had to help her mom make a living. She had to walk all over Khanh Hoi to sell snacks. In the afternoon, she looked after her many siblings so that her mom could prepare dinner. Everyday, Le Thuy carried her siblings to the nearby Khanh Hoi market to play. There was a radio repair shop right by the market, and the shop’s owner would play one Vong Co song “The Girl Who Sells the Paper Lanterns” (Cô bán đèn hoa giấy), sung by Thanh Huong, over and over on his phonograph. 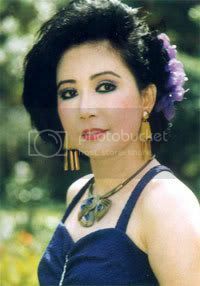 Thanh Huong was a famous actress at the time, and the daughter of a well-known Cai Luong couple: composer Nam Chau and actress Ms. Tu Sang. Thanh Huong inherited the sweet voice from her mom; hence, she sang the song very well and beautifully. It was Thanh Huong and that song that made Le Thuy yearn to be a singer, and she did! In her 40-year career, she must have performed hundreds of plays and sung thousands of songs. Fans have described her in loving terms such as “the singer whose voice is like a bell vibrating, cool as a breeze, and clear as crystal…” But to Le Thuy, her thoughts about being famous are this simple: “I try to stay with the basic, original, and straight-forward style. I do not use any fancy tricks in singing.” This might explain why she remains one of the most favorite actresses of all times. The audiences become “addicted” to her singing, which explains the record number of her performances, 60 plays a year! Le Thuy, the beloved “daughter” in the hearts and minds of the Vietnamese people, became famous at a very young age, even before the two actresses that I mentioned earlier: My Chau and Thanh Kim Hue. So why do I write about her last? I just wanted to compare these three very different actresses and their singing voices. Le Thuy does not have the mysterious attractions as My Chau, nor the fancy techniques as Thanh Kim Hue, yet her voice is pure, simple, sweet, and expressive. It gently enters the listeners’ hearts, spreads out like a cool breeze, and stays close to the loved ones. Her down-to-earth demeanor seems to carry the trace of the alluvium and scent of Tien and Hau rivers – her birthplace – which makes her so dear to the Southerners. As a result, the Southerners think of her as their own beloved daughter. Being famous from 1963 with the two songs “Chuc Anh Dai” and “Co Hang Che Tuoi,” Le Thuy and Minh Canh remain the two most favorite performers to this day. If you happen to hear someone sing on the radio from a distance, once or many times over, you can be sure that it is Le Thuy, the one whom Diep Lang called “an exceptional singer” of the traditional music of Cai Luong.